GRIP: The GRIP Adaptor mount is designed for devices such as phones (with or without case/cover) or GPS. It works best if the device has a flat back side (rather than curved or rounded). Includes Ultra-Swivel, adaptor stem and GRIP cradle. Does not include the mounting bracket. 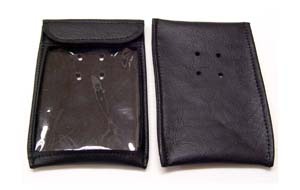 * Be sure to verify the dimensions of device with case/sleeve/cover when determining size. 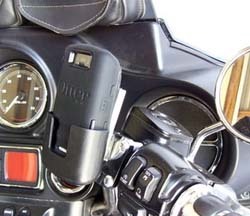 LD-GRIP: The LD-GRIP Mount's flexible design accommodates a variety of phones and other devices, and makes it safer and more convenient to use them while riding a motorcycle. Medium: Maximum width = 3.5" (min 1.875") / Depth = .875"
Large: Maximum width = 4.5" (min 1.75") / Depth = .875"
This Mount includes everything you need (except an allen wrench). All components are stainless steel and aluminum so they won't wear or rust. Note: Works best if the device has a flat back side (rather than curved or rounded). Fits: All Harley-Davidson brake and clutch controls (screw spacing 1.5"). Reversible design fits both left (clutch) and right (brake) side controls! Note: Some Sportster models have a different thread pattern on the switch housing (you may need to purchase bolts directly from a Harley dealer). A mount for any accessory gadget! A compliment to our Dash Shelf or as another mounting option for Harley-Davidson dressers. All hardware used is stainless steel. 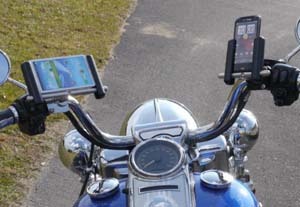 LD-EDHD-GPS-Nuvi: Nuvi GPS mount for left or right H-D switch controls. Select chrome or black anodized finish. 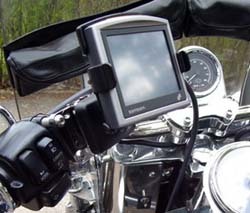 LD-EDCH-GPS-NUVI: Nuvi GPS mount for 1" or 1.25" handlebars. Select chrome or black anodized finish. 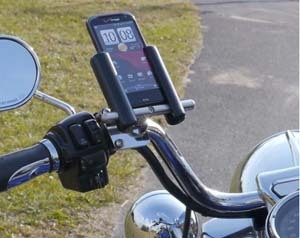 LD-EDHD-GPS-ZUMO: Zumo GPS mount for left or right H-D switch controls. Select chrome or black anodized finish. Note: not recommended for the 660/665. 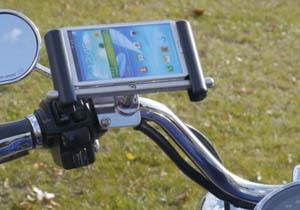 LD-EDCH-GPS-ZUMO: Zumo GPS mount for 1" or 1.25" handlebars. Select chrome or black anodized finish. 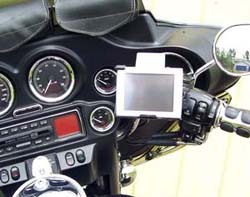 Note: not receommended for the 660/665..
LD-EDHD-GPS-TOM: Tom Tom GPS mount for left or right H-D switch controls. Select chrome or black anodized finish. 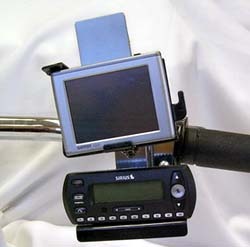 LD-EDCH-GPS-TOM: Tom Tom GPS mount for 1" or 1.25" handlebars. Select chrome or black anodized finish. 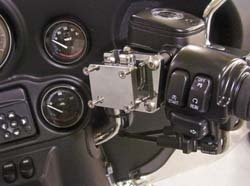 LD-EDHD-MAG: Magellan GPS mount for left or right H-D switch controls. Select chrome or black anodized finish. 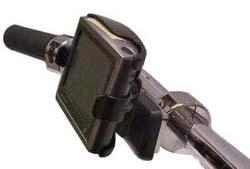 LD-EDCH-MAG: Magellan GPS mount for 1" or 1.25" handlebars. Select chrome or black anodized finish. LD-EDHD-GPS: Mount for other GPS units. If you have a Garmin Nuvi or Zumo, Tom Tom or Magellan, please refer to those specific units. If you have another type of GPS, here's how to tell if this kit will work for you: Some units have the 4-hole "AMPS" pattern or diamond-shaped "RAM" pattern right on their backside, or on the back of the "cradle" (if one came with your GPS). (Note: You may need to remove the suction cup.) Some units require the purchase of a "cradle." In either case, all you need to mount it on a motorcycle is this kit. 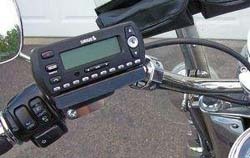 LD-EDCH-GPS: Same as above but for handlebar mount. 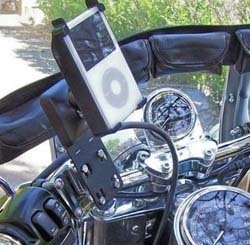 LD-EDU-CHA: Universal smart phone mounting kit. 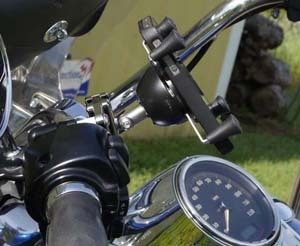 This kit mounts on a round bar: motorcycle handlebars, engine guard bars, etc. (1" to 1-1/4" diameters). Mounting bracket with UltraSecure (chrome): slender allen screw that installs cross-wise after sliding the plate in means you'll never lose your electronics! 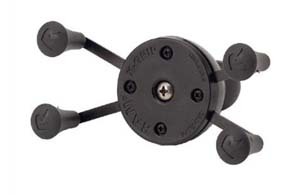 Caddy Deluxe holding plate (chrome): multi-faceted lug offers SIX different angles. Plate area dimensions: 1-13/16" x 1-1/2" x 5/16" with standard "amps" pattern threaded holes (1.25" x 1.5"). Universal cradle: Designed to hold a variety of cell phones and small electronic devices, this cradle has padded locking side clamps that close tightly on the item. To release the clamp hold, simply press the button at the bottom left side of the cradle, which will spring the clamps open. At the base of the cradle are two supports. Velcro "dots" you may use for extra "holding power." 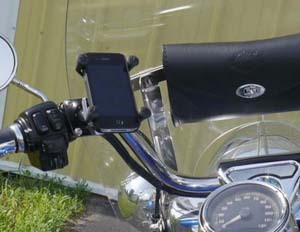 LD-EDCH-CELL-OTTER: Finally – a good-looking and highly-functional way to mount smart phones (HTC, Samsung, Nokia, Palm and others) on your motorcycle Note: This kit works with Otterbox Defender cases and other holsters/cases with a wide clip (up to 1.5"). Maximum depth: 1-3/4". 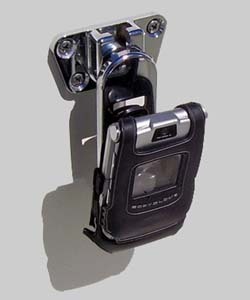 Kit includes: Chrome mounting bracket & hardware with UltraSecure feature and Chrome holding plate: multi-faceted lug offers SIX different angles. New extra-wide plate area provides extra security. 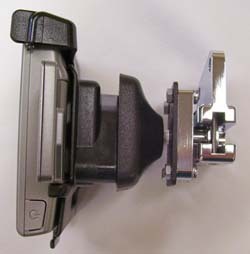 LD-EDCH-CELL-OTTER: Same but for handlebar mount. GC-HD Gadget Caddy Deluxe: Mounts to the HD controls. 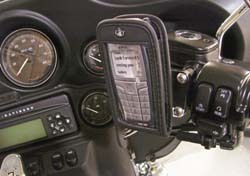 Easily mount your cell phone, satellite radio, iPod, GPS, CB's, palm pilot, pagers, camera bags or belt clip or holster. 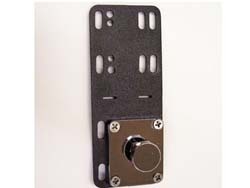 Kit includes: electronics holding plate w/wide plate area and mounting bracket. GC-HL Gadget Caddy Lite: Mounts to the HD controls. 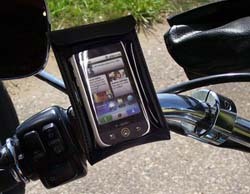 Easily mount your cell phone, satellite radio, iPod, GPS, CB's, palm pilot, pagers, camera bags or belt clip or holster. 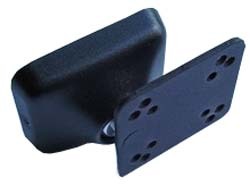 Kit includes: electronics holding clip notch (accommodates a wide variety of clips) and mounting bracket. 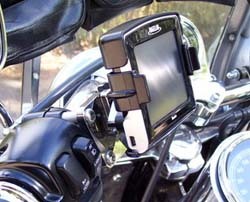 GH-HD & GH-HL: Same as above for Deluxe and Lite but mounts to you HD's " stock handlebars. GH-HDD & GH-HLD: Same as agove but for 1-1/4" diameter bars. GF-HD & GF-HL: Same as above for Deluxe and Lite but mounts to the a flat surface. Can be mounted to our Glove Box Doors. 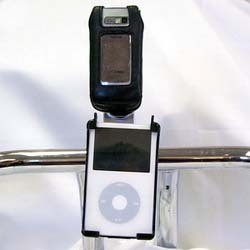 GI-HL: Handlebar mount for Ipods and Iphones for 1" stock bars. GI-HLD: Same as above but for 1-1/4" diameter bars. Available Cradles: We offer cradles for popular Garmin Nuvi GPS units: Nuvi 200, 200W, 300, 600, 700, 800, Magellan 3200, 4200, Tom Tom One, XL, 720/920. For others see fitment guide to the right. GC-MG: Multi-Gadget Mount accessory. 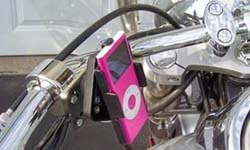 For cell phones, GPS, iPod/MP3, Satellite radio, or drink holders. 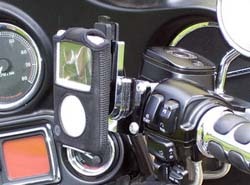 How is a rider to mount so many gadgets on their motorcycle? This is the answer! 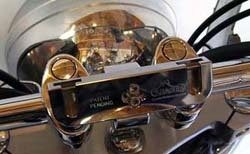 This beautifully chromed, made-in-the-USA mount attaches to the handlebar or controls on the Harley – no special tools required. Mount vertically OR horizontally! Each slotted end accommodates your choice of gadgets: (GPS, iPod/MP3,iPhone/cell phone, Satellite radio, Camera, Radar detector, Blackberry (PDA), Drink holders, Toll passes) Never lose 'em! Thread-lock screws and the popular UltraSecurity feature ensure your electronics will never leave your bike without your permission. This product is JUST the plate you see to the right (which includes the lug and 2 screws). You can mount this bar in any of four different directions, both vertically and horizontally. 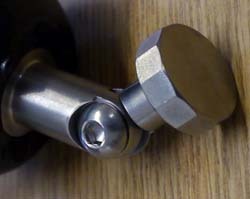 Dimensions: 4-5/8" total width with the slot centers 3-1/2" apart. PLEASE NOTE: the GC-MG must used with other Caddy components like the GC-HD or GH-HD. GC-TT: Amazing "angle-ability" - tilt it wherever you need it! Installs between the eCaddy Deluxe plate and the GPS or satellite radio. Simply add to your order. GC-PO: Waterproof case. This waterproof phone cover makes rain a non-issue! Simply slip your phone in! Now available in Medium (3-3/8" x 5-1/4") and Large (3-7/8" x 6-1/4"). Features: A sleek, slim look that fits most phones/iPods (3-3/8" x 5-1/4") Large clear vinyl front, YES, you can operate your phone through the protective cover! Velcro flap closure. Wires can be run out the edge of the Velcro closure if desired. 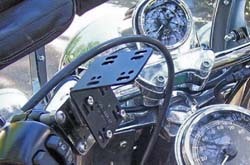 U-Tech: Ultra Tech GPS Mounting Plate. If you've ever wanted or needed to get your GPS, iPod, iPhone, satellite radio or other electronics UP or OUT a bit (for example, maybe it's too close to your tank or fairing)... The UltraTech is for you! When used with the Gadget Caddy Deluxe, your item can be mounted at not just six angles - but TWELVE angles! Combine it with the UltraTilt, and there's literally NO limit to where and how you can mount! And there's MORE: The UltraTech plate can be bent up to 120 degrees! Now you have another option for those hard-to-mount items! 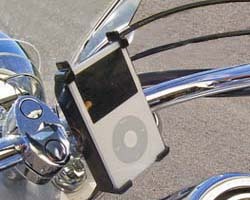 NOTE: The Ultra-Tech plate is intended for use with the Gadget Caddy mounting system. Shown above with Gadget Caddy Deluxe plate (additional $24.99). Dimensions: 5" x 2". XG-AM: The Grip Adaptor mount is designed for devices such as phones (with or without case/cover) or GPS. It works best if the device has a flat back side (rather than curved or rounded). * Be sure to verify the dimensions of your device with any case/sleeve/cover when determining overall size. 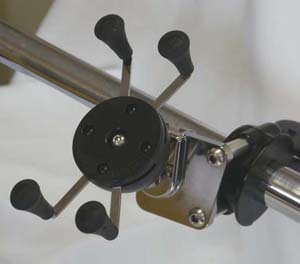 Includes Ultra-Swivel, adaptor stem and grip cradle. DOES NOT INCLUDE MOUNTING BRACKET. 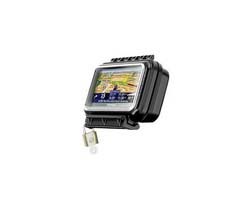 Garmin Nuvi GPS: Use the Caddy Deluxe WITH a "cradle." We often have the cradles available (see ordering page). Or you can get them at other GPS-related Web sites. 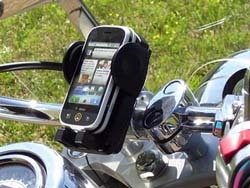 Garmin ZUMO GPS: Use Caddy Deluxe with Garmin's "motorcycle mount" part #010-10859-00 (suggested retail $85.00, see garmin.com). NOTE: Mounting requires longer screws not normally included in kit; be sure to add it to your shopping cart. 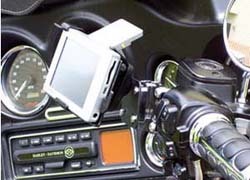 Garmin Quest GPS: Use Caddy Deluxe with Garmin's "motorcycle mounting kit" part #010-10610-00 (suggested retail: $72.50, see garmin.com). 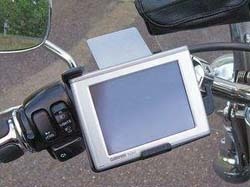 Garmin 2600/2700/2800 series GPS: Use Caddy Deluxe with Garmin's "motorcycle mount" part #010-10495-01 (suggested retail $19.98, see garmin.com). Garmin StreetPilot, C300/C500 series: our products do not work properly. Reason: rounded backside. Garmin hand-helds (e.g. eTrex, MAP, etc. ): if you can put a belt clip on them, or buy a “holster” for them that includes a belt clip, purchase the Caddy Lite. Magellan: some Magellin units have the 4-hole "AMPS" pattern right on their backside. If so, all you need is te Caddy Deluxe. 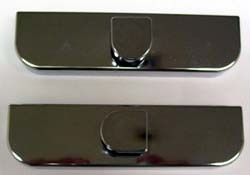 Other Magellin units require the purchase of a “cradle.” If the cradle has the standard 4-hole “AMPS” pattern on it, purchase the Caddy Deluxe. Lawrence: our products do not work properly. Reason: rounded backside.